Graham Rahal, IndyCar’s youngest winning driver, has announced a two-year sponsorship deal with the TBC Corporation, which owns several automobile tire distributors. 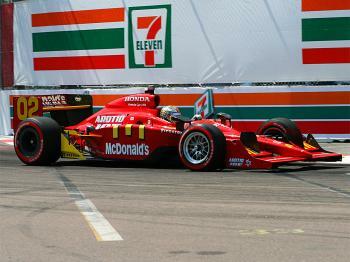 There has been much speculation that Rahal would be driving for Target-Ganassi in 2011. Ganassi has won seven IndyCar championships: 1996–1999, 2003, and 2009-2010. Other teams mentioned include Newman-Hass Racing which gave Rahal his start in IndyCar, Rahal-Letterman Racing, which is owned by Graham’s father, Bobby Rahal, and Panther Racing, whence current driver Dan Wheldon is rumored to be departing. After two promising seasons in IndyCar which saw him become the youngest race winner (St. Petersburg, 2008,) and the youngest pole winner (St. Petersburg 2009,) Rahal could not find a full-time ride for 2010. By dint of hard work he managed to cobble together sponsorship for twelve of the seventeen races, often in sub-par equipment on low-budget teams. The TBC sponsorship is great news for Rahal fans and also great news for the sport. As a young a personable American driver, Rahal attracts many fans and is a great publicity draw for the series. He has been featured in ads promoting the series, something which is sure to continue now that he will have a stable, well-funded ride. While the dollar amount has not been disclosed, it is estimated to coast at minimum $5 million per year to run an IndyCar team. Graham’s new sponsor, TBC bills itself as “The nation’s largest marketer of tires for the automotive replacement market.” Its subsidiaries include Tire Kingdom, National Tire and Battery, Merchant’s Tire, Big O Tires, Carroll Tires, Tire Kingdom International, and Treadways. TBC Corp. is owned by Sumitomo Corporation, one of Japan’s biggest trading and investment corporations.